How lovely it is to see so many men and women attending this ‘Custody in Crisis’ conference. We have been delayed a little this afternoon and so I have used the time to make myself known to you. My name is Robert Whiston and I am the chairman of the UK-based “Men’s Aid” organisation – but today I am here as President of the European wide “Platform for European Fathers” (PEF). As we have heard from previous speakers the difficulties we face are the same – regardless of the language we speak, country we come from, or legal system. We are here, yes, to discuss child-father relationships, but as is evident from the speakers, and the delegates I’ve met before the meeting started, that under the present regime custody adversely affects not just fathers but grandparents and second wives. Previous speakers have touched upon and covered many of the topics I had planned to discuss. This is something of an advantage for me as it reinforces my analysis and it allows me to echo their findings. It should galvanise the convictions we all hold – from Belgian to Portugal and from Germany to Switzerland – that things need to change. It is clear from listening today to the Vice President (Roberta Angelilli), and the former President that the EU is aware of the issues at the highest levels. Snr. Carlo Cassini, President of Constitutional Affairs Commission, has today made it clear that the EU – and he as a former judge – recognises the very many things have to be altered in the our legal systems to achieve an equitable situation for fathers. We now have to translate that recognition into action. PEF was recently actively engaged in organising a public opinion poll in both Belgium and Holland. The results showed that of those asked, the overwhelming majority supported more father involvement with child care and 67% of women were in favour of ‘shared parenting.’  (See Appendix A below). What previous speakers have allowed me to do, therefore, is “ad lib” and focus on aspects not yet covered and to give them more prominence than would otherwise have been possible. Time constraints mean I will have to be brief only touching on a few aspects but I will provide a fuller picture by way of Appendices on the Internet (see below). Dr Jan Piet de Man spoke of “parenting plans” and joint physical custody in Belgium. Dr. Martin Widrig outlined the issues how custody worked in Switzerland, and family court judge, Antonio Jose Fialho, explored some of the problems and lack of compatible terminology when trying to compare Portuguese law. Just by way of background – by 1912 the system of divorce and separation was not working well in Britain and prompted a Royal Commission to look into the ‘collapse of morals’ – working class women left destitute, and in part, the side-effects of fatherless children. However, the First World War intervened and nothing happened. Historically, the next big change came in 1956 with the Morton Report (see also ‘Putting Asunder’), and the Law Commission’s report, ‘The Field of Choice’ in 1966 which set the parameter for divorce reform and thus custody matters. Several of today’s speakers used citations based on research from Anglo-Saxon countries – so as the only Anglo-Saxon here, I think I ought to reply. We have to acknowledge this lack of research outside Anglo-Saxon countries may be a problem but to those critics who say the research is too biased because of its Anglo-Saxon roots, I would reply that what is being measured is the “human condition” and that does not change from one side of the border to another or because the local language changes. North America has been a source of much of the research and we have to accept that their budgets have for a long time been bigger than those in Europe – and I include Britain in that assessment. In my own country, and this is possible true in your countries, it has been ‘fashionable’ to focus repeatedly on lone mothers and never to examine lone fathers and fathers looking after children. But the problem – as I shall refer to later – is that the judiciary chooses not to enforce it. Prof. Parkinson states that a minimum definition of ‘shared care’ in international literature is 30% of nights with each parent. That is also the view of all British father and family rights groups. In his view the term “shared care” rather than shared parenting, is accepted around the world to generally mean that children spend an equal time or ‘near’ equal time with each parent. What we, in England, would call shared parenting and those in France might term co-parenting. Whilst professing ‘great sympathy for these parents’, i.e. fathers, denied reasonable time with their child, the Norgrove committee could not bring itself to accept that “a presumption of shared parenting time would bring about the improvements . . . . parents seek”, or indeed, would improve “outcomes” (for which, as we have heard today, there is overwhelming evidence that it would improve outcomes). There are good grounds in Anglo-Saxon countries to reset the definition of ‘continuing involvement’ mentioned by Prof. Parkinson because legally and technically speaking – as the law now stands, and without added shared parenting (or care) legislation – fathers already have “continuing involvement” just by spending a few hours a week with their child. ‘Sole mother custody’, permitting as it does, a few hours of visiting time to fathers constitutes ‘continuing involvement’ in English common law. This is not good enough. What is needed is more hours and days, i.e. a greater quantum of time. Realising this discrepancy (from country to country) in hours and days allotted and the terms used PEF has adopted a ‘simple-to-understand’ measure for ‘shared parenting.’ It seeks to eliminate and overcome the present inherent confusion, exploited by opponents by basing shared parenting on the number of “sleepovers” or overnight stays granted by the courts to both parents. Only days that involve ‘overnight’ stays count towards shared parenting time – i.e. the 30% Prof. Parkinson mentioned above. We would urge all other groups to also adopt this basis. Adopting a standardised measure – using the criterion of ‘sleepovers’ – would benefit all countries when trying to compare and contrast their regime with other countries using vastly differing terminologies. Phrase such as “shared care”, “shared parenting”, “co-parenting” and “shared residence” could in an instant, all be directly compared and averages, trends etc deduced. For instance, the usual custody order in England (and, from what I have heard today, this is probably true of many European countries), is for a father to be allowed to see his child at the weekends and perhaps on one afternoon mid-week. But only one of those ‘visits’ might involve a sleepover. 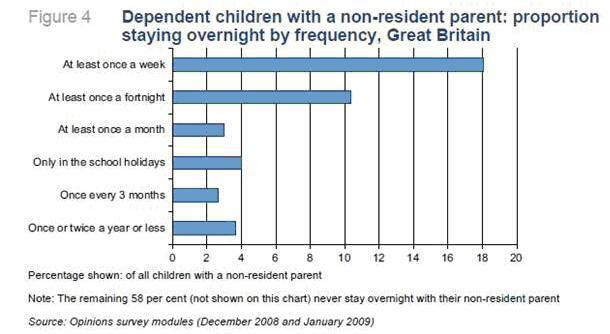 Since 2006 (almost 10 years ago) the British government, in an official reports, has been promising improved ‘overnight’ stay and sleepover time for fathers. What does that translate into ? In terms of days, 52 nights amounts to 14% of a calendar year (365 days / 52 nights). A large minority of fathers in Britain do not even get this 14%. So as a minimum we would want to see the average minimum time increased from 14% to 30% – as measured in ‘sleepovers.’ In our more enlightened times this increase cannot be regarded as unreasonable but the present 14% is totally unacceptable. Before the conference, I was asked to include information about Ireland as well as Britain but in the few minutes available to me I can touch on only a few of the distinctions – and then only superficially. In the fullness of time detailed notes together with detailed citations and graphs will be available on the PEF website. In many ways, the basis of Irish law has historically been the same as Britain’s and even today it often duplicates statute laws passed in Britain 2 or 3 years previously. However, the main difference between the two countries is that in the mid-1930s (after independence) Southern Ireland adopted a written Constitution which put the family and parents at the centre of the state (See Article 41 to 43 of the Irish Constitution). It is superb in my view, obliging as it does all Irish governments to keep a covenant with its citizens by putting parents and family life at the heart of the Irish Constitution (See Article 41 to 43 of the Irish Constitution). Britain has never had a single all-embracing Bill of Rights or Constitution but has relied on the protection of “Common Law” – which, like the Rules of Cricket remains to this day ‘a total mystery’ to many Europeans. Britain may not have a single Constitution but in fact we have several unrelated written ones and until 40 years ago we have always had the power of Common Law (the people’s law) to limit the power of the state to interfere in family matters. Only ‘statute law’ can override British ‘Common Law’ and that is what has happened in Britain. The ‘personal has become the political’ – and as a result family law (formerly Common Law) has been regulated by vested interests resulting in poor quality and badly working Statute law. Ireland has not only Constitutional law but statute law, together with a mixture of residual Common Law left over from its days as part of Great Britain. But regardless of legal framework fathers in Ireland and Britain suffer the same iniquities. In the case of Britain it is Statute law that is misused and in Ireland it is the Constitution that is overruled. There is another difference, however, between Britain and Ireland, and that is in their population size – 60 million versus 4½ million for Ireland. By comparison to other EU states, Britain, France and Germany have huge populations and monumental numbers of divorces and fatherless children. Whatever new system we advocate in the future as a replacement must be seen to work not only in smaller countries but also on a more massive scale when applied to the larger EU countries where the price of failure will be more massive. From my talks this morning at the Council of Europe, with the Children’s Rights Division, it is apparent that this dimension, if it has been noted, is being ignored. As I speak, England’s parliament is going through the pretence of supposedly strengthening ‘shared parenting’  But none of the options proposed will create any greater legislative support for shared parenting than does the existing law – which is poor at best. In Britain 90% to 95 % of custody awards are given to mothers – the same can be said of cohabitees (unmarried couples) who separate, and from what other speakers have said this is a not uncommon rate in their countries. (See Appendix B). This – as you must all be aware – is premised on obsolete 19th values and the 20th century model of the sole male breadwinner. As society has changed dramatically in the last 40 years, then so too must the law. This obsolete custody regime is commonly referred to as “sole-mother-custody” and is the default model in all English-speaking countries with only one or two exceptions, e.g. Australia. Previous speakers have outlined their nation’s experience of custody and parenting and I suspect there will be many similarities to Britain’s. So I would like to expand the ‘event horizon’ – surrounding the black hole of child custody – and dip into adjacent fields in a general way. Claims in the media often exaggerate the level of lone fatherhood and of fathers caring for their children in a shared or equal manner. For example, only last week the Huffington Post quoted the respected Pew Center, in America, as reporting that, “the number of single fathers has risen nine fold” compared with 50 years ago. In reality that ‘9 times increase’ had raised the number of ‘lone fathers’ looking after children to only 8% – so it is so small as to be minute. Similarly, in the UK, it is claimed that 5% of children are cared for by lone fathers. But look a little deeper and most of these alleged ‘lone fathers’ are, in fact, widowers. In my view, and you may agree, many European governments are eager to make reassuring noises in the realm of family law reforms – but never actually deliver. This might even apply to your country. “Spouses shall enjoy equality of rights and responsibilities of a private law character between them, and in their relations with their children, as to marriage, during marriage and in the event of its dissolution.” (See Appendix C). So far only a few countries, such as Albania, Bosnia, Croatia and the Czech Republic, have ratified this undertaking. By in large, some of the smaller countries have signed it but not yet ratified it – but it is the larger more ‘advanced’ counties, e.g. Netherlands, Denmark, France, Germany, Spain, and the United Kingdom – to name but few – who have not even signed up to the commitment to better facilitate contact by fathers and have certainly not ratified it. In any event the positives of Article 5 are negated and contradicted in the detailed wording found in Clause 36 of the ‘Explanatory notes’ of the Convention which allows countries to escape the full rigours of Article 5. If your country’s government seems unwilling, or unable, to deliver better father contact time (visitation), then it could be in part due to the non-adoption of this particular Convention. Theoretically, Britain’s child custody legislation (following a divorce) is one of the most advanced. As far back as 1989 legislation accepted the concept of ‘shared residence’ (not just shared parenting) and legalised it. But by a directive of government it has never been implemented in full and Britain has never had ‘shared residence’ (except in exceptional cases) and is no better placed than some of the more backward countries in the EU. In Britain the Children Act 1989 is the pivotal legislation and it allowed for courts to make ANY (yes, any) type of custody order – and by implication any apportionment of time – it thinks suitable. Although the “sole-mother-custody” regime applies to over 90% of all custody awards in this has not always been the case. Before the 1989 Children Act (which is the crucial piece of legislation in Britain), ‘joint custody’ – a forerunner of shared parenting – was growing in popularity throughout the 1980s. In the context of British law, ‘joint custody’ has always meant ‘joint legal and physical custody’, and not just the more abstract American ‘joint legal custody’ which imparts no rights. So widespread is this ignorance that one has to ask if researchers and politicians choose to ignore it official data ? Mothers have a veto over a father’s visitation times (and this has also affected grandparent’s rights). The damage done to a child (the ‘pathologies’ as Dr Jan Piet de Man detailed), of not having fatherly input was for 20 years or more, down played or ignored. The new phenomenon that has emerged from this situation is “Parental Alienation” and is an unpleasant consequence of “sole-mother-custody” and the ‘locking-out’ of fathers from their children’s lives. After listening to today’s speakers there is, I feel, a danger not yet foreseen and which we might be ‘sleepwalking’ into and if I explain the British version you may see parallels. Originally, parents had both custody and guardianship of their children and courts were reluctant to intervene unless it involved obvious abuse or mistreatment. But statute laws were introduced in 1989 to remove the status of guardianship specifically from fathers, (the guardianship and custody role of unmarried mothers remains ambiguous), and ‘custody’ was replaced by ‘residence.’ (Appendix D). In place of ‘guardianship’ both divorced parents were given ‘joint parental responsibility’ after divorce which may be comparable to “joint parental authority” in some other EU countries. However, in test cases ‘joint parental responsibility’ has been shown to be overridden more easily by the courts (a paper tiger) compared with guardianship rights which would not have allowed them. So I would just bring this play on words to your attention which could later have far-reaching effects. We have learnt to our cost, that ‘residence’ and ‘joint parental responsibility’ is a lightweight alternative to the former terms and status. Courts can veto parental wishes and it is the courts that now have the exclusive power once reserved for parents. (Appendix D). The result is that custody in the UK is, I am sad to say, the same today as it was in 1989 – more than 25 years ago – it has become set in concrete, and arguably worse since parents can now parent only ‘under licence’ from more interventionist courts. I had also planned to deal at length with information supplied to the public that is manipulated and misused for ulterior motives but today others have covered the ground most adequately. So I can only lend my support to their comments. This is remarkable, if not implausible, particularly when compared with other more credible data (more examples can be found at Appendix E). If we examine reports from Denmark and Australia we find the level of shared parenting in Denmark is put at 20% and in Australia (since 2006) at around 15%. Only Sweden, long associated with shared parenting, can mange the same 20% of children in shared parenting arrangements after divorce. All 3 countries have specific ‘shared parenting’ legislation in force – so how can Britain – with shared parenting ‘killed at birth’ in 1989 – have shared parenting amounting to 17% ? The obvious answer is a manipulation of definitions. Equally, the claim is made in academic and official circles that when divorcing or separating only 10% of custody cases are decided in court and that parents sort out their own arrangement in 90% of instances. The implication is that at 10%, any reform is hardly worthwhile. With approx. 140,000 divorces every year affecting about 120,000 children, this is numerically impossible to square (allegedly 12,000 child welfare reports would have to be made out), when official statistics shows over 90,000 court orders made each year, and each would be dependent on a welfare report. (Appendix B and F). Before going further – and running out of time – I should just mention the key year of 1970. I don’t know if anyone has realised it but before 1970 there were no fathers’ groups. All fathers groups in Europe and North America date from after 1970. We would not be here today but for all the legal (and social) changes between 1970 and 1973. These include divorce reform (between the years 1969 and 1973) legalised abortion in 1967 (UK), Equal Pay legislation, 1970 to 1975, and the universal usage of “the pill.” Not least was a seismic change is custody rules. Without inferring any moral judgment, the year 1969 saw the first falls across the Western world in marriage numbers and the first notable increases in cohabitation. Thereafter, the state’s subsidy in expenditure terms to each child rose even though the birthrate declined – so each child unit cost the state more. (Appendix G). Precisely because it is ethereal, lacks solidity and continuity or the ability to meet a child’s needs as the child matures, is arbitrarily set at a very young age, and is ‘indeterminable’ (i.e. it is impossible to define), it should be the least attractive of candidates to choose as a foundation for custody. The concept ‘feigns’ putting child rights ahead of parental rights in the name of doing what is best for the child but in reality not only does the child’s voice not matter but parental opinions are brushed aside and the real power to determine a child’s fate rests with the court – which often never sees the child or at best ‘knows’ it after one of two hours of reading of court reports. Though Anna Freud’s and her books are central to our present dilemma, she, and her lack of competence, sexual predilections and dubious mental state, are frequently overlooked. Freud’s mantra of ‘the child’s best interests’ should have been used to assist children’s development and help them towards a better future. But instead it has been used to cripple any attempt to normalise relationships between fathers and their children. In my view, Freud’s experimentation [her term], on “orphaned” children is not transferable to children of divorce. Some of her children subjects, like those in London, were orphaned and traumatised by the bombing of the early 1940s. Others like those from the Theresienstadt (Czech equiv. Terezín), concentration camp were children of the Holocaust – and completely feral. Completely without adult input, they had no idea of speech, language or social interaction. At least the London orphans had known their parents (albeit briefly) and felt parental love somewhere in their lives. However, none of the 2 above scenarios comes close to that of children whose parents are divorcing – these children know their parents and have felt their parents’ deep and unconditional love. For their part the parents may not be able to get along but they still deeply love their children. I believe, this dichotomy goes to the heart of the present 2013 debate in Britain – politicians cannot separate in their minds the two distinct scenarios of Public law (dealing with sometimes horrendous abuse and neglect suffered by children), and Private law cases where the two parents simply want a divorce but where both parents dearly love and want to maintain a relationship with their children. The present situation is that in both Ireland and Britain the judiciary have chosen to ignore their obligations or at least interpret them in an unexpected way. In the case of Ireland the Constitution has been sidelined and in the case of Britain the judiciary selects only those parts of Statute law it finds convenient. The result is a disfigurement of ‘the family’; it is by-passed and fathers are no longer the central figures in the families they create and financially support. This has had “collateral damage” to society and the tax-payer, about which I will touch upon later. (Appendix G). Having said all that I would like to end on a slightly more optimistic note. Looking to the future in Britain there are one or two bright spots of sanity in the form of parents being able to agree their own maintenance payments – without the ‘intervention’ of the state or rigid formulas. Already a reality is the re-introduction of the Married Man’s Allowance – an income tax coding concession – which is an official nod from government towards incentivising marriage and the role stability plays in children’s lives. There is also the, in my view, beneficial switch to US “community property” style law which will bring gender equality a step nearer – a regime that I understand some EU countries already have. In England, at present, we have a rather ugly and blunt instrument of asset apportionment (confiscation) which disadvantages fathers excessively but never women. In addition, enforceable pre-nuptial contracts may become law in England and their scope may also include the ability to determine Child Support, property apportionment at divorce and child custody matters. If Britain does one day legalise Pre-Nuptial Contracts together with the promise post-nuptial contracts then Ireland will probably not be far behind. Encouraging fathers – married or unmarried – to be at the heart of stable, loving family units not only releases resources for hard-pressed governments but provides a larger “tax base” for future governmental expenditure and improvements that will benefit government and assist all of our standards of living. “Do fathers have adequate contact rights under current law ?” The result can be seen displayed here – 71% said they did not (Fig 1). Q. Should fathers be given greater access to their children after a divorce ? The result showed that 75% of Brits think fathers should have the same rights as mothers regarding the care and parenting of their children after divorce (2nd Feb 2012). 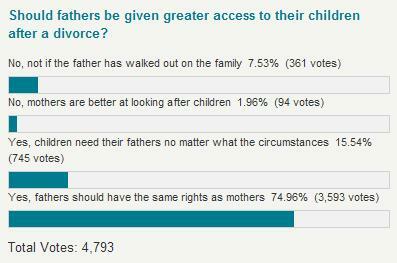 Only 7% said ‘no’ and only 2% (94 votes out of 4,793), said mothers were better at looking after children. The article also stated that 8% of single parents in Britain are fathers but no source was cited. The results will not only give hope to campaign groups that have argued for years that fathers deserve a legal right to more equal access after a divorce but politically it isolates parties opposed to shared parenting. An implication first revealed by the surveys PEF was associated with in both Belgium and Holland where the left and right political parties were shown to be out of touch with the aspirations of their electorate, especially women, who were in agreement at over 67%. The achieved sample comprises of 265 respondents who were resident parents and 170 respondents who were non-resident parents. There were 10 respondents who were both a resident parent and a non-resident parent. As in 2002, the majority (89 per cent) of resident parents were female while the majority of non-resident parents were male (88 per cent). Another example underpinning the perception is in the ‘Millennium Cohort Study First, Second, Third and Fourth Surveys’, (page 50). Of the 18,815 questioned there were only 28 male main respondents, all natural fathers, 18 of whom were lone fathers”. Since 1991 the figures have ceased to be collected and so we cannot be absolutely certain but we can gain an insight from other sources, e.g. court awards and Judicial Statistics, the General Household Survey (organised by ONS). The graph left (Fig 2), is derived from General Household Survey of ‘heads of households’ among lone parents (2002). (Source: General Household Survey (GHS), ‘Population Trends’, No 109, Autumn 2002 (Fig 6, p.53). Viewed over a longer time period the decline in father care – shown in yellow- is more apparent (from 13.7% in 1971 to 7.8% in 1992). However, as ONS pointed out at the time, the number of ‘lone fathers’ was too small to be reliable and a significant number were widowers. A Bradshaw & Stimson (1997) paper. first noted what is now recognized as a ‘gender divide’, characterised by perennial female under-reporting (see Bradshaw below). 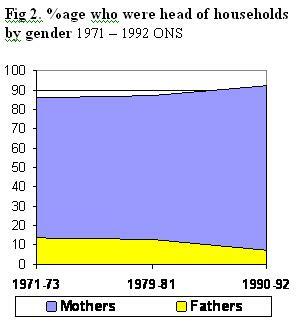 The graph also reveals the compensating rise for mothers given custody and thus became ‘head of lone parent households’ (shown in blue), rose from 86.0% in 1971 to 92.2% in 1992. [Coincidentally, the phenomena of custody figures ceasing to be collected also occurred in New Zealand when they made legislative changes]. The cessation of data collection caused by the Children Act 1989 means that we have to use other indirect sources to assess custody by parents. One method is to measure the number of ‘dependent children’ cared for by lone parents (Fig 3). As one would expect, in 1993 there are no lone fathers in the 16 – 24 age group (though this might not hold true today, 2013). As divorce becomes statistically more likely, i.e. in the 30 to 40-year-old age groups, the number of ‘never married’ women who are heads of households, i.e. with dependent children falls – but the number of separated, or divorced, or widowed who become heads of households increases (Fig 3). In part this is reinforced by extra-marital fertility, i.e. births to females who are not married. The Table also shows that for men in the statistically more ‘at risk’ age of divorce range lone fathers with ‘dependent children’ increase in number from between 9% to 29%, However, once again since the sample size is small so it cannot be relied upon and a significant number will again be widowers. To confirm the falling trend in father care since 1970, the graph (left) shows the ‘disposal’ of children by the courts (by percentage), prior to the Children Act 1989, which came into force in 1991 (source: Judicial Statistics, courtesy of ‘SPIG’). A healthy situation was developing in the 1980s with more fathers permitted by the courts to become involved in their children’s lives (see ‘joint custody’). However, all the gains of joint custody were negated by the Children Act 1989 – the decline in mother custody was reversed. 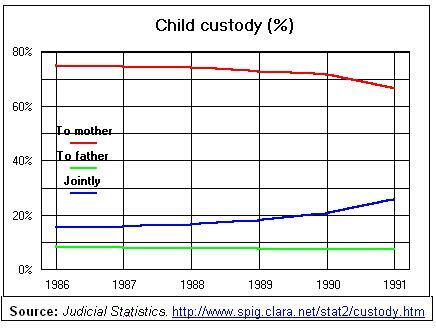 The Table below, ‘Child custody after divorce’ (Fig 4), clearly shows the fall in mother custody, down to 66%, and the rise in joint custody awards from 1986 to 1991(from 15% to 25%). [The present shared parenting campaign across all of Europe and America is to restore this level of fatherly involvement]. ‘Joint custody’ as a court order award disappeared from family court judgments (it was intended to be replaced by ‘shared residence’ orders and ‘no order’ orders) and so the proportion of mother custody rose from 70% in 1990 to 90% almost immediately by 1992. ‘Residence orders’ (Sect 8 of the Children Act 1989), do not specify sole or shared residence, they can be granted to one or two parents and even to ‘third parties’, e.g. a lawyer. Protocol 7 of the “Convention on Contact concerning Children” issued by the Council of Europe (1998), and thus part of the European Convention for Human Rights (ECHR)’ states: Spouses shall enjoy equality of rights and responsibilities of a private law character between them, and in their relations with their children, as to marriage, during marriage and in the event of its dissolution.” [ REF: Council of Europe – ETS no. 117 http://conventions.coe.int/Treaty/EN/Reports/HTML/117.htm ]. However, the situation is immediately cancelled out (as with UN Charters) by wording that allows each state to exempt themselves as Clause 36 of the ‘Explanatory notes’ demonstrates: 36. The fact that spouses shall enjoy equality of rights and responsibilities in their relations with their children shall not prevent States from taking such measures as are necessary in the interests of the children. [ REF: http://conventions.coe.int/Treaty/EN/Reports/Html/117.htm ]. Then again the situation is contradicted by the “Convention on Contact concerning Children” (Council of Europe – ETS No. 192), especially Articles 3, 4, and 5. [ Ref http://www.conventions.coe.int/Treaty/en/Treaties/Html/192.htm ]. Only 8 of the 27 EU countries have ratified this Convention (e.g. Albania, Romania, Czech Republic and Croatia). None of the major western EU countries have signed it let alone ratified it. Guardianship It is necessary to distinguish, in a few words, between the technical points of “Guardianship” and “Custody”. When both parents are married to one another they both have custody of the child and the father is the guardian, that is to say, he is the person who is responsible for the care of the child (though the actual care may be done by his wife), provides financial support, guides, safeguards his interests, etc and who makes all the major decisions in their life. These would include, for example, where the child lives, schooling, religion, medical permission and procedures, provides sustenance, the giving of permissions (in loco parentis) and being held accountable by all the authorities for the child. If a father is absent for any length of time then guardianship rights automatically pass (devolve) to the mother for that period. “Custody” can easily be confused with the powers of “guardianship”, but custody is defined as where the child lives ‘primarily’ with the parent. When parents are married to one another the parents are deemed to have joint custody. Where parents were not married, ie the child was illegitimate, the mother had sole guardianship rights and the father none. Without guardianship rights one cannot expect to have custody rights. Unfortunately, the Children Act 1989 abolished guardianship rights for married fathers and reduced them to the same status as unmarried fathers:-. “The rule of law that a father is the natural guardian of his legitimate child is abolished”. – Children Act 1989, Part 2 (4). In English law unmarried fathers have historically never had any ‘rights’ (and few responsibilities) over their offspring Legitimate and illegitimate were also thus put on the same plane with the law remaining silent over whether mothers still had guardianship in the absence of the father’s right. All fathers were instead given the status of ‘joint parental responsibility’ which claimed to have the same powers – though events have shown clearly they do not. The ‘Gingerbread’ surveys of 2008 and 2009 set out to find ‘What were the problems and difficulties mothers experienced with contact arrangements.’ This included how mothers managed their arrangements for the non-resident father to spend time with his children. They did not set out to find the number, or the effectiveness, of ‘shared parenting’ but their results have been used for that purpose in the years since 2008. The survey of 2008 had 550 participants with the overwhelming majority being mothers with residence and only a small minority of non-resident fathers. http://www.nuffieldfoundation.org/sites/default/files/Problematic%20contact%20after%20separation%20and%20divorce.pdf. 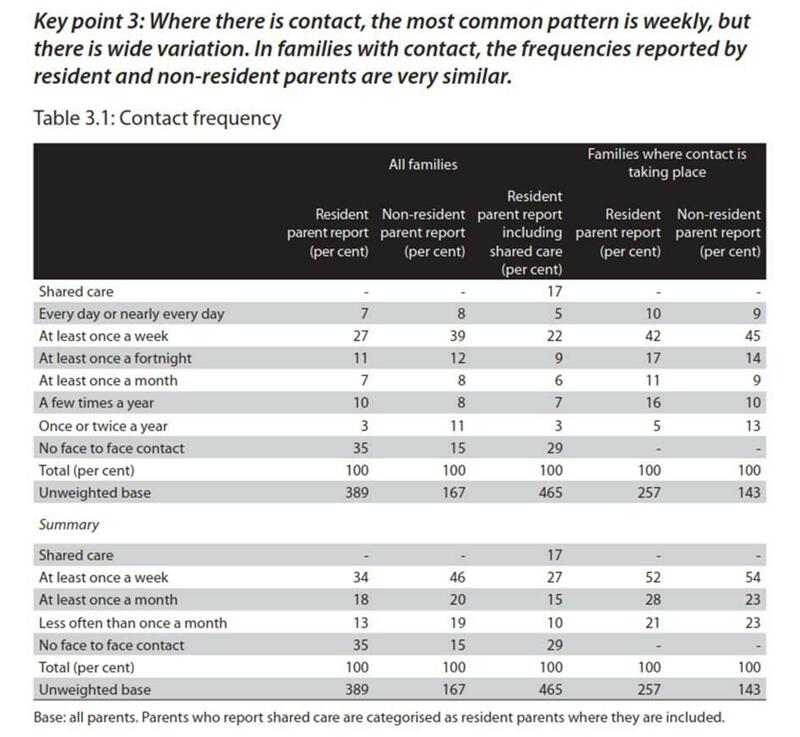 The survey of 2009 (http://www.nuffieldfoundation.org/contact-problems-separated-families), also by Victoria Peacey & Joan Hunt, used a sub-set of the 2008 participants and numbered only 41 parents from 40 families (27 resident parents and 14 non-resident parents). The level of ‘shared parenting’ in England & Wales – deduced from their survey of ‘problematic contact’ was a claim of 17%. This data has been accepted in government circles and, as the graph below shows, the official organ of statistics in Britain (the ONS) would appear to confirm the level – but at 18%. However, the 18% is based on measurements where 58% of children who never stay with their non-resident parent (father), were omitted and those included were those who had a non-resident parent (father). [See ONS “Figure 4” below]. This would imply only 42% are being counted or did not have a non-resident father – this might map onto the level of illegitimate birth in the UK. Since in the region of 90% of custody (residence) awards are to mothers the graph above is measuring only a fraction of a population ( see Appendix A above). In comparing Britain with Denmark, Peacey & Hunt would prefer to put custody arrangements in a favourable light (17%), but as the Table here shows (Fig 5), in 2001 children who lived (i.e. resided) with both parents amounted to over 75%. The following Table (Table 3.1) is taken from Peacey & Hunt’s 2009 Gingerbread survey entitled; “I’m not saying it was easy . . .”. In the 2nd half, i.e. “Summary” it is noticeable how mothers tend to under-report or report adversely, i.e. 35% say there is ‘no face-to-face’ time but fathers report this happens in only 15% of cases. Mothers downplay categories such as “At least every week” and ‘At least every month’ (at 34 and 18) but fathers report it to be 46 and 20 respectively. This phenomenon was first identified by Bradshaw and Stimson in a 1997 paper (http://robertwhiston.wordpress.com/2008/05/09/8/ ). It was then confirmed by Bradshaw and his team at the University of York in research into Child Support payments (see “Non-Resident Fathers in Britain”, Bradshaw, Stimson, Williams & Skinner (Uni. of York, pub. SPRU). Interim report 1997). The anticipated ‘plateau’ in divorce numbers foreseen by reformers in 1968 never materialised in the immediately post-reform years. The country had to wait until 1986 before the disquieting increase ceased and it was not clear until the mid 1990s – given the annual fluctuations – that a plateau had, indeed, been reached. The graphic (right) shows divorcing numbers finally ‘plateau’ed’ at approx 150,000 per annum after 1986. In the period we learn from Parliamentary Answers (among other sources), that about 120,000 children p.a. were affected by their parents divorce. Numerous government sponsored Reports and academic papers have, since 2004, promulgated the view that only 10% of custody cases are determined by family courts. This dissemination of this figure is thought by many to be untrue and flawed. This is entirely due to the Omnibus Survey and an examination of the basis (see below) explains why it failed to capture an accurate picture for such custody issues. From academia, Prof Liz Trinder – now at University of Exeter – writing in the Guardian (6th Feb 2012), also wrongly relied on data from the ONS Omnibus Survey when she claimed that, “Only 10% of separated families go to court about contact.” (See http://www.guardian.co.uk/commentisfree/2012/feb/06/no-bias-against-fathers-childrens-act ). “As already stated, around 10% of parents experiencing relationship breakdown choose to resolve their contact issues with the help of the courts every year. In 2003 this resulted in 67,000 contact orders being made by the courts. 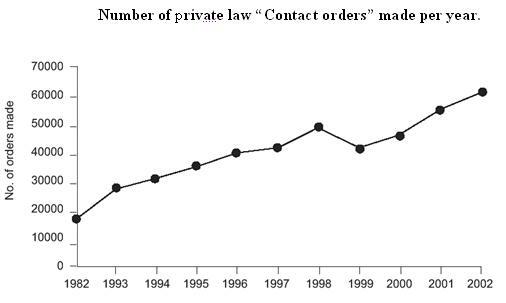 This figure continues the rising trend that has been seen over the previous 10 years, between 1992 and 2002, the number of private law contact orders made by courts in England and Wales more than tripled from 17,470 to 61,356. Indeed, this is the exact wording used in a parliamentary answer (see http://www.publications.parliament. ukhttp://www.publications.parliament.uk/pa/cm200405/cmselect/cmconst/116/116we32.htm ) and has been used on frequent occasions since. It is no coincidence that these cabal of luminaries, and others, are of the persuasion that contact is working fine and is the best option for children and that shared parenting is fraught with dangers and drawbacks. Doubt has to be cast on this assertion of 10% of custody awards because data from many other sources indicate a much higher level. For instance, the “Disposal of selected applicants in private law in all tiers of court” (see Fig 6), lists all awards processed by court in England & Wales. If only 10% we settled by a court order then “Total Orders Made” would be in the region of 15,000 (i.e. 10% of 150,000 divorces). But as we can see in 2002 and 2011 Residence orders alone were in excess of 30,000 and Contact orders ranged up as high as 60,000. To underline the level of court ordered custody awards, CAFCASS, a semi governmental agency, handled 33,803 private law cases (i.e. divorce) and together with public law cases handled 73,937 children’s cases in 2004. CAFCASS produces annual report and the numbers can be checked for any year since 2001. In 2007-08 CAFCASS worked with 77,134 children and in 2010 it worked, according to their Annual Report, with 147,000. So how can it be claimed that only 10% go through the court system ? Hoisted by their own petard ? What this claim really hides is that the fate of 90% of children fail to go through the court system and therefore, presumably, the state is derelict in its statutory duty of care and actually has no idea what happens to them. Are these reformers who feign ‘child rights and ‘child protection’, intellectually “comfortable” with the fact that if their claims are true it would mean 90% of children each year disappear from the safety radar ? Is it acceptable to leave 90% of children without a safety net, i.e. arguably ‘at risk’, solely due to having no “check list” as required by the Children Act 1989 ?is this why some private law cases migrate to public law some years later when abuse, neglect, torture and even death have occurred ? The various government Depts. (i.e. Whitehall), are themselves unable to co-ordinate an agreed figure for children of separating parent. 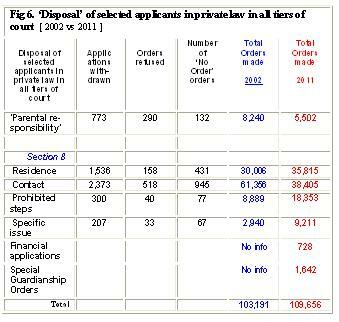 For example, the Ministry of Justice (see Table 2.4 of ‘Family matters’) showed that in 2011 the total number of ‘applications’ to courts amounted to some 178,517 p.a. (using historical standards, this indicates a separation level of some 165,000 couples). 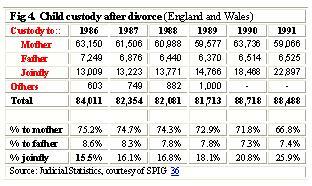 [See also Table 2.5 Family Matters Summary statistics on matrimonial proceedings, 2007-2011 http://www.justice.gov.uk/downloads/statistics/courts-and-sentencing/jcs-2011/family-matters-tables-chp2-2011.xls ]. An estimated 88,000 children aged under 5 were affected by the separation of their unmarried parents in 2003, compared with about 31,000 children under 5 whose married parents divorced, the research concludes. According to the 2001 census, 59% of households with children are married, 11% are co-habiting and 22% are lone parent families. The study is likely to provoke heated discussion among family policy specialists. While it argues for the Government to do more actively to promote marriage, critics say that encouraging parents who do not want to marry to do so simply does not work. Harry Benson, author of the research and director of the Bristol Community Family Trust, an independent relationship education and research body, based his findings on Office for National Statistics data on divorce and jointly registerd births, together with ONS research on the ratio between breakdown rates for married and unmarried families. Is this, one has to wonder, the population being measured by the DCA and the Omnibus survey that has given rise to the absurd 10% figure ? The trend did not start rising before 1950 and the impression that it continued through the 1950s is totally false. What actually happened was that under war-time conditions divorces increased and ’emergency powers’ were enacted between 1947 and 1950. 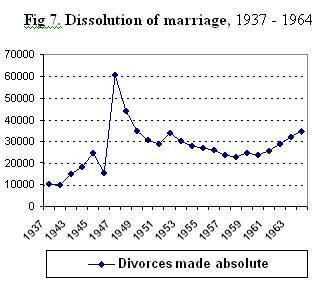 Divorce had actually fallen by 1950 and thereafter, all through the 1950s, divorces actually declined as the diagram shows (see Fig 7). The actuality is shown in Fig 7. 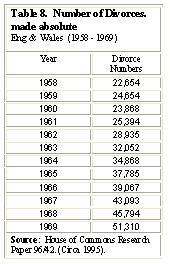 No where in the 1950s did divorce reach 100,000 pa. It was not until the mid 1970 (not the 1960s) when divorces first topped 100,000 pa.
“ . . .. One of the other inaccuracies that I identified in the Norgrove Report was the much repeated claim that 90% of people resolve parenting arrangements for themselves without litigation. The Report cited one study to the effect that “only 10% of separating couples go to court to settle their disputes about contact” and concluded therefore that “most separating couples” make their own arrangements (Family Justice Review, Final Report, 2011, p.133). However, the study the Committee cited does not actually support that 10% figure and nor does it indicate that the remainder, or even “most” couples, make their own arrangements. . . . “ – Ref. Lader, 2008, Table 2.9 p.23). The late 1960s perhaps represented the high water mark of Cold War paranoia and the sense of latent dangers. Into this atmosphere certain milestones were passed in England including the legalising in 1967 of homosexuality, albeit only among adults over 21, was seen as brave if not foolhardy given the known dangers of espionage. Thereafter, the cultural hegemony (in the non-Marxist sense), of shared values whereby the complex stratified social structures (social order), that gave identity and value to each social and economic level, began to unravel. The public of 1970 were not equipped to assess what was happening to them and ‘for them’. They were unaware that their world was going to be turned upside down. These events have now been adopted into the mainstream culture for a younger generation and part of a ‘normal’, liberal society, i.e. taken for granted. After 1970 and at nearly every level of economic and social life, social trends began to move away and take up their present position, e.g. declining number of marriages, increases in divorce, a falling birth rate, the pensions ‘panic’, smaller Completed Family Size (CFS), Total Fertility Rate (TFR) falling overall but in some sectors increasing. These changes were not ‘pain free’, nor were they without cost. The unit cost paid by the state for each child, for example, more than doubled. The public had not the faintest hint of this. There was no expectation at the time that the reforms would cost the tax-payer dear – close to the £20 billion in benefit subsidies in 2010. 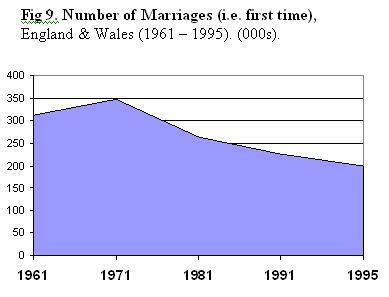 In England & Wales the number of first time marriages (the true barometer) reached their zenith in 1971 and in the years thereafter they relentlessly declined (Fig 9). 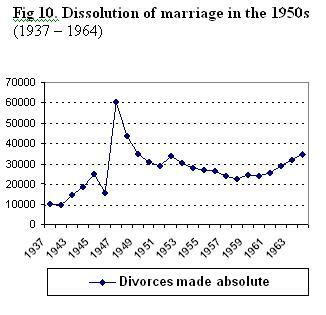 Throughout the 1950s divorce had been declining (see Fig 7), and marriages increasing – cohabitation was so unheard of that is was not officially counted or measured until 1989. However, during the 1960s small legal amendments were made to how payout to divorcing spouses (wives) were made, e.g. lump sums, resulting in a slight upward swing – as the graph, Fig 10 below, reveals. Then in the years between 1968 and 1972 most advanced Western countries curiously adopted the same form of divorce reform. 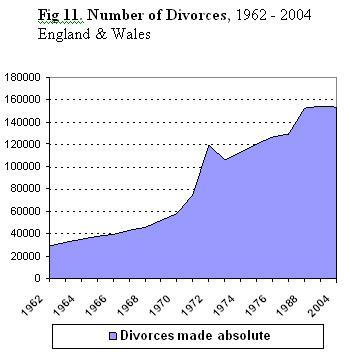 The trend of a growing number of divorces did not develop a rapid momentum during the 1960s but was a slow one (see Fig 10 and 11). 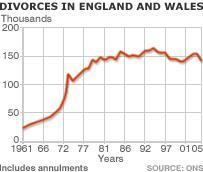 Until the present era the previous peak number of divorces had been in 1947 (60,000), caused by the return of husbands from ‘active service’ in the armed forces and finding matters not as they would have wished. ‘Emergency measures’ were put in hand to grant “Quickie” divorces to deal with the backlog. Twenty five percent of all divorces were petitions by husbands on the grounds of their wife’s adultery. Today there are around half that number of men who petition for divorce. Divorce number had gradually increased to 60,000 by 1969 -71 which some have used to justify the need for the reforms of two years later. However, the level of divorce after World War II, which also reached 60,000 in 1947, was incentivised to a large degree by a relaxing of court rules at the instigation of government and policies aimed at recognising the pre-existing marital dislocation caused by war and subsidising the process. Those incentives and subsidies were removed in 1951 and the results were almost instantaneous. At the time (i.e. 1968 – 1972), the argument for remodeling the Western world’s divorce regimes was that after a small surge in divorce numbers would be followed by slump and continue at that plateau (reminiscent of 1947 to 1950). Fig 11 (right) shows the gradual increase throughout the 1960s followed by the sudden upsurge of 1971 -72 as the reforms became operational. There was a small ‘slump’ (circa 1973) but it was short-lived and divorce numbers increased unabated to the present level of 150,000 per annum. The combined effects of social change among marriage, divorce and cohabitation together with subsidies (since 1976), for never-married-mothers has produced greater nominal fertility, a large population, yet a smaller birth rate and smaller family size. The cost to Society is in the form of taxation, i.e. the burden of subsidies to non-family units with children (SMHs), ‘alternative life-styles’ and to support ‘low income’ households. The government’s own subsidy to women who bring a divorce petition in the form of Legal Aid was costing £2 billion per annum – jepardising the whole legal aid budget. New Zealand had faced exactly the same problems 10 years earlier. British Courts were administering approximately £4.7 billion of ‘client’ assets and the divorce ‘industry’ was worth around £20 billion per annum in fees. Addendum – 13th Nov 2013, initial statistical reports indicate a 9% drop in private law cases brought using Legal Aid, as measured between Oct 2012 and Oct 2013. This is thought to be the first effects of the Legal Aid, Sentencing and Punishment of Offenders Act 2012” (LASPO), introduced in June 2012 which denies legal aid in certain family court matters. In a 300-page report published on Dec 11th 2006, family breakdowns (inc. divorce), caused ‘social problems’ costing more than £20 billion a year (see The Times, Jenny Percival, http://www.timesonline.co.uk/tol/news/politics/article667633.ece ). 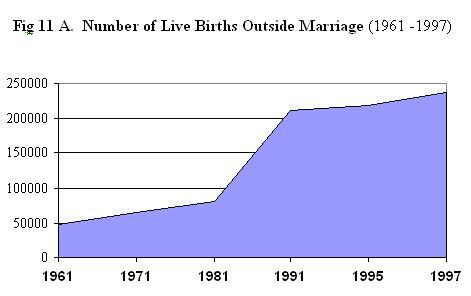 If one of the underlying assumptions at the time of the 1969 Divorce Reform Act was that the inability to divorce and re-marry lead to an increase in illegitimate births then that myth was dispelled in the following years as births outside wedlock dramatically increased from approx. 50,000 to 250,000 (Fig 11A). The ease with which state benefits were widened, deepened, made available to the unmarried, and single motherhood made politically acceptable during the 1980s led to a significant increase. Indeed, it became politically incorrect to criticise ‘single motherhood’ in any form, publicly. Unnoticed by much of the population a technical but far-reaching change was introduced in this period whereby ‘benefits’, which had always been based on ‘contributions paid’ in by claimants, were replaced by payments based on perceived ‘need.’ Thus, those that had never paid into the system (teenage mothers, single mothers and their children, etc) gained most. As the following graph displays (Fig 12), the unit cost, as measured by Treasury Expenditure, rose dramatically over the years between 1970 and 1997 – mainly benefits to children yet the number of child decreased. This graph is not adjusted for inflation and when it is, as in Dr. Patricia Morgan’s analysis, the increase is still significant. 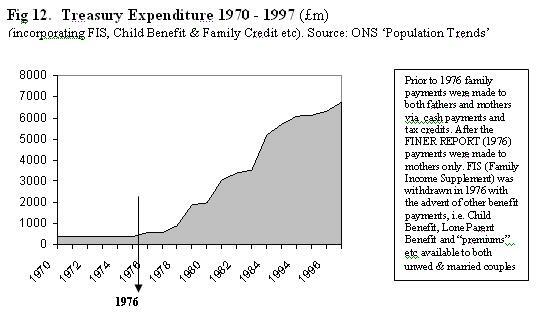 The year 1976 is highlighted due to the introduction of the Finer Report’s recommendations that state benefits, e.g. ‘Child Benefit’ etc, should be paid to all mothers – not just married mothers. The societal relevance of the above (expenditure and illegitimacy) can be found in Prof. Lawrence Stone’s marriage and divorce trilogy using historical records found at Lambeth Palace. 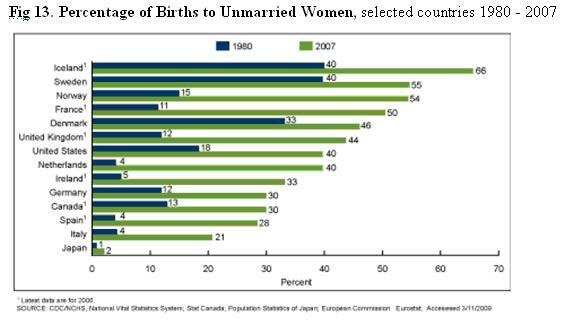 Similar social changes were happening in other countries with comparable consequences as the graph below (Fig 13) shows (Percentage of Births to Unmarried Women, 1980 – 2007). There are many interesting comparisons in the above graphic, none more so than Holland and Britain. Holland with smaller population than the UK has nonetheless seen a 10 fold increase in births to unmarried women (4 to 40), whereas Britain has seen only a 4 fold increase (12 to 44). The key factor in that SLMs in Britain are numerically much larger in comparison to Holland. 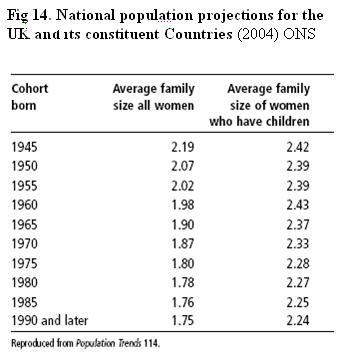 The Table below (Fig 14), is a 2004-based ‘national population projections for the UK’ (and its constituent countries, e.g. Scotland). It depicts the trend from 1945 to 1990 with the actual family size for women who have children, rather than those who might in the future have children, falling from 2.42 in 1945 to 2.24 in 1990. In the 1970s birth rates tumbled according to ONS data. At the same time, abortions were increasing. Once restricted to married women and for medical imperatives it was evolving into a form of delayed contraception. In a given year, if we add back the annual number of abortions, i.e. 190,000, to the number of ‘live births’, i.e. of 646,000 per annum the combined total of 836,000 births per annum would equal the numbers born in the 1950s (i.e., 1959) and restore the 2.4 children per family ratio. This trend of fewer children per family has only been exacerbated in the years since 1990 with average family sizes plunging below the critical Population Replacement level of 2.1. Presently it is spiralling downwards to 1.75 in 2011 and may go lower (Source: ONS Population Trends 118, Winter 2004, and see also Population Trends 109, Autumn 2002). The picture, if anything, is more depressing than the 1.75 would indicate (see Fig 15/ ‘Figure’ 1 below). This is because the picture reflects an aggregate picture of Completed Family Size units and includes single women who usually have smaller families, and immigrants who conversely usually have slightly larger family sizes then the indigenous population. The Total Fertility Rate (TFR) is the average number of children a hypothetical woman would be assumed to have. 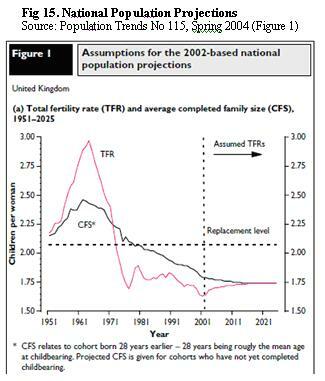 The catastrophe for Britain, in common with other EU nations, is that since 1981 the CFS trend has dipped below ‘Replacement level’, and that since 1961 TFR has also collapsed. Arguably, though both began declining in 1961, TFR has stabilised at 1.75 since 1981, and that 2011 has been equal to CFS trend line. 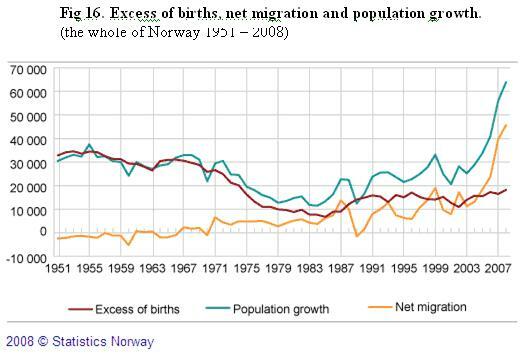 However, this hides something that has been identified by Norway Statistics, namely, that the majority of population increase, and this affects CFS and TFR, has been Third World immigration. See below. Collateral damage resulting from a falling TFR and CFS, can be seen in the state pension schemes whose viability is seen as being threatened. 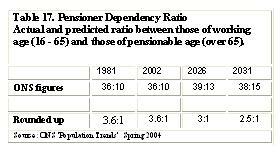 (page 11, Table 4), shows the ratio between those of working age (16 – 65) and those of pensionable age (over 65). The ratio was constant from 1981 to 2002 at approx. 3:1 (36m v 10m 2002), as Fig 17 demonstrates. In 2026 this is expected to be 39m v 13m and by 2031 38m v 15m (33% and 40% respectively). Prior to the banking collapse of 2008 this was a ‘manufactured’ panic in that sufficient fund would still be available to pay pensions even at the 2.5: 1 ratio in 2031. It is invariably forgotten that Pensioner Dependency Ratio in 1900 was 14:1 and fell to 3.5:1 in 2000. Despite this 100 year decline, pensions were still paid and even increased. By 2040 this ratio is projected to fall to 2.5:1. The projected decline in this age-based support ratio is not only less steep than recent history but it should have come as no surprise. Men of the ‘baby boom’ years i.e. circa 1947, will, in the main, live only 10 to 12 years after retirement and so will cease to be an extraordinary drain on the government backed National Insurance Fund (NIF) by 2022 – well short of the alleged ‘difficult’ year of 2038 or 2050. 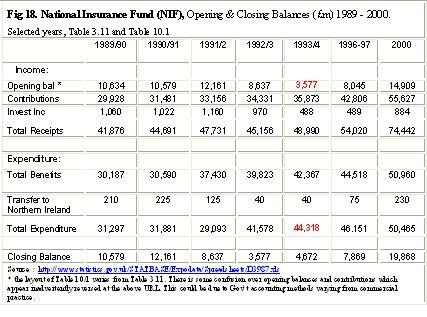 The Table below (Fig 18) shows selected years including some adverse opening balance events, such as 1993-94, and how quickly the fund bounced back, i.e. the opening and closing balance in 2000. Even when the opening balance is perilously low – as in 1993/94 at £3,577,000,000 – there was still sufficient liquidity to fund a higher level of claimants that year at £44,318,000,000. The inclusion of payments to Northern Ireland (from “the Troubles” starting in 1970 to the ‘peace process’ ending in 2000), is just one example of the many ways all governments siphon off money from the NIF to finance other activities. If there is a pension danger it will come in the form of women particularly divorced and separated women. They will have paid less into the National Insurance Fund but draw our more. They will live for, say, 25 years after retirement at 60 (2007 + 25 = 2032), and even 10 years ago represented 90% of all beds allocated in residential care home. The majority of these women will cease to be an extraordinary drain on the NIF by 2032. So after 2022 the demand on the NIF should have almost halved and by 2032 when most women will have come to the end of their lives, it should have reduced by close to another half. The worst case scenario at present seems to revolve around figures for the years 2020 and 2038. “On present trends the worker in 2041 will be the equivalent of more than two workers today” – (Catalyst 2002: 10). This will mean modest improvements in state pensions are immediately affordable without increasing contributions because of the NIF surplus. Mullan’s conclusion is still achievable but only if the current banking and lending crisis is overcome – and it will also only be achievable when Starbucks, Amazon, Vodaphone and a host of other billion pound turnover companies begin paying their fair share of taxes. Prof Lawrence Stone “Road to divorce. England 1530-1987” (Pub’d 1990). For example: Belgium 10½ million; Portugal 10¾ million; Greece 10¾ million; Switzerland 8 million; Germany 80 million; France 65 million; Holland 16 million. Children and Families Bill 2013. Huffington Post, Oct 2013. http://www.pewsocialtrends.org/2013/07/02/the-rise-of-single-fathers/ and http://www.huffingtonpost.com/2013/07/02/single-fathers-pew-research_n_3535586.html? a) Based on a 2008 ‘Gingerbread’ report written by Victoria Peacey & Joan Hunt and funded by the Nuffield Foundation. b) “I’m not saying it was easy: problematic contact after separation and divorce.” Peacey V and Hunt J (2009). See CAFCASS Annual Report, and ONS Judicial Statistics versus ‘Child contact with non-resident parents’ (2004) and “Caring for children after parental separation: would legislation for shared parenting time help children ?” (May 2011). Co-authored with legal experts Solnit and Goldstein. Dorothy Burlington’s children all suffered horribly under Freud’s therapy which lasted 40 years. “Strengthening families, promoting parental responsibility: the future of child maintenance” – – Green Paper, Dept Work Pensions (DWP). This entry was posted in Custody, English, Guardianship, PEF, Robert Whiston (Men’s Aid UK), Shared Parenting, Shared residence. Bookmark the permalink.